This lithograph published by Curwen Press for The Lyons Lithographs third series is available for £925 from Emma Mason. Original prints specialist Emma Mason has taken over care of the archive of Barnett Freedman (1901-58), one of the 20th century’s leading lithographers, on behalf of the artist’s family. The gallery is working with Vince Freedman, the artist’s son, to sell works and use the archives to widen interest in his prints. Barnet attended St Martin’s School of Art and the Royal College of Art and eventually started work as an illustrator and commercial designer, producing work for clients such as Ealing Films, the Post Office and BP. He also oversaw lithography projects for Lyons and Guinness and became a war artist, accompanying the expeditionary force in the spring of 1940. Eventually, the gallery hopes to stage an exhibition of his works. 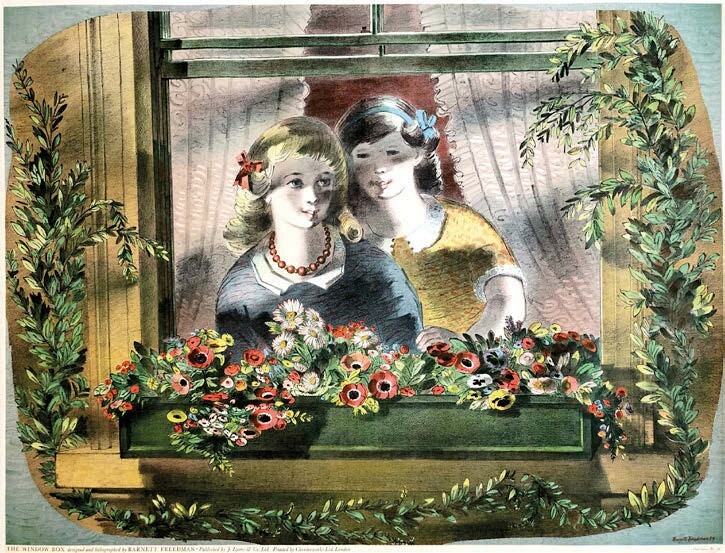 Until then, it offers various works by the artists on its site including Window Box (1955) a 72 x 97cm lithograph published by Curwen Press for The Lyons Lithographs third series (above). These sets of lithographs were commissioned by Lyons Teashops to combat the decline of interior décor and lack of decorating material in the years of post-war austerity. It is available for £925.